Murray was born in Toronto, Canada. His main art education was with Central Technical's Art School, The Ontario College of Art and Seneca's School of Communication Arts in Toronto, Ontario, Canada. He worked as a graphic artist and designer/art director for 40 years, beginning with Pelikan paints, markers, and later with various computer software. His expertise was in the design of signage, logos and brochures for restaurant, hotel and multi-use complexes, with projects in Canada, USA and Europe. Murray also produced fine art paintings in a variety of styles, completing his first oil painting at the age of 12, and by working with watercolor and acrylics since the early '70s. In 1995 he moved to Hawaii until 2007. As an active member, he became president of the Association of Hawaii Artists creating their logo, monthly newsletter and the organization and setup of annual juried shows throughout the islands. Murray obtained his American citizenship. In 2005 Murray built his first scale model kit, 'taking it to the max' by creating a fantasy diorama using his fine art painting skills in detailing. 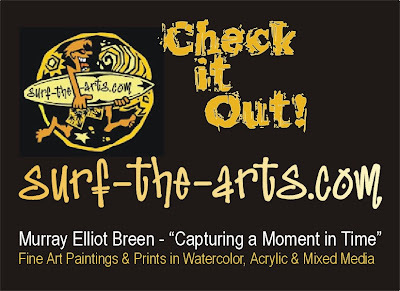 In December 2006 a blog 'www.surf-the-arts.com' was started to share his step-by-step creation process online, and other artistic experiences. This blog now continues here! On leaving Hawaii, he moved to Canada's beautiful Okanagan Valley in British Columbia, famous for its orchards and vineyards. Just a few years later, he moved to Tigard, Oregon, and then to Boise, Idaho in 2016. Murray is also an avid amateur photographer with over 35,000 photos on Flickr of his art and travels. He looks forward to exploring a bit of the spectacular natural areas of Idaho. Mentors, influences and special thanks to: My grandfather Percy (a watercolorist) who said "Get painting". My former History of Art teacher, Doris MCCarthy (a leading Canadian female artist), who showed me the world's people and their arts. The Art Gallery of Toronto/Ontario, The Royal Ontario Museum, and the McMichael Canadian Art Collection. Fellow graphic artists, designers and architects that I worked with, plus many members of the Association of Hawaii Artists. Copyright © 2017 Arts of Murray Elliot Breen. All Rights Reserved.